Question: "I want to try a yoga class. I mean, it looks fun and I think I'd like it, but that's so different than what I'm used to with treadmills, ellipticals and weights. How do I get involved in taking a yoga class and feel like I belong?" Answer: "It may be out of your comfort zone to try a new class, but that's where changes happen...when you do something different and take a leap. 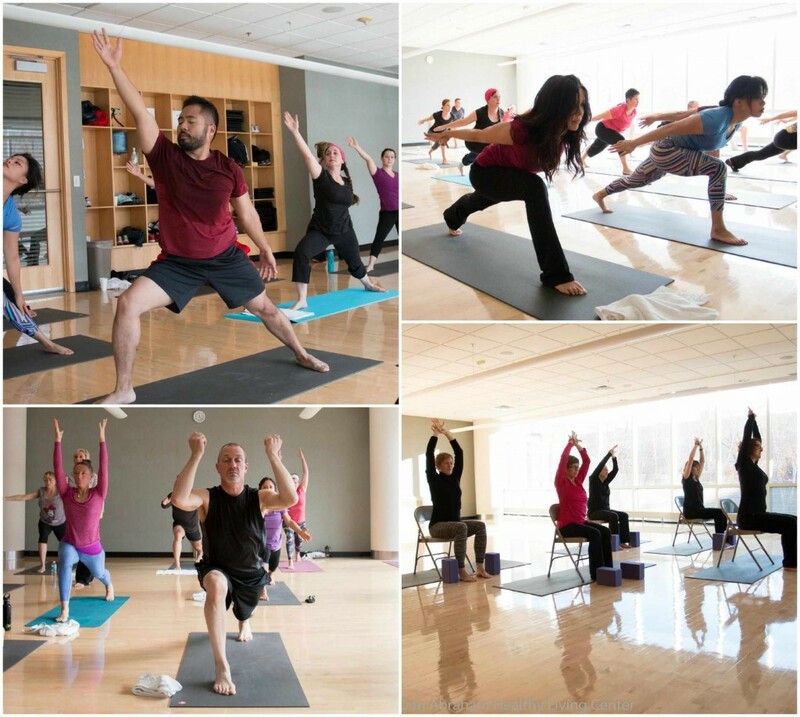 We have plenty of yoga classes to help you feel comfortable and which can improve your balance and flexibility." Yin Restore Yoga: Longer held poses to offer a deeper stretch. Class takes place on the floor. Chair Yoga: Provides gently active, chair-assisted movements accommodating the unique needs of all participants and their experience levels. Yoga Basics: Builds a foundation for yoga practice. Movements flow from pose to pose using breath. Also includes balancing poses & core strengthening. Yoga: An advanced class from Yoga Basics. Focus on sequences and poses at the beginner and intermediate level. Studio is heated. Warm Yoga Fusion: Fuses yoga flow with static held poses. Studio is heated. Yoga Foundations Program: This 8-week program is very popular for participants that are new to yoga. This class will go through the basics of yoga. This program will be offered again in early 2016. More details to come later this year. Private Yoga Lessons: Schedule a private yoga session with one of our yoga instructors for that extra attention, instruction and comfort. Visit the front desk for more details on how to sign up! View our group fitness schedule to see when these classes are available or stop by the front desk to register for one of our programs. To learn more about yoga, read our 5 common myths.